A supporter of Venezuela’s President Nicolas Maduro holds a poster of him during a rally in Urena, Venezuela, Monday, Feb. 11, 2019. ​Maduro has made a show of overseeing military operations played on state TV almost daily. He’s jogged with troops in formation, mounted an amphibious tank and railed against what he says is an impending U.S. invasion that he has likened to a Latin American Vietnam. 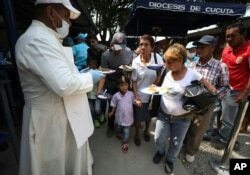 Priest Richard Garcia hands out free lunches to Venezuelan migrants at the “Divina Providencia” migrant shelter in La Parada, near Cucuta, on the border with Venezuela, Colombia, Monday, Feb. 11, 2019.